Damavand is a popular mountaineering peak for summer. It is surly one of the most difficult ones in the world for winter climbing. Despite its mild climbing ridges and lack of technical difficulties, freezing temperature and strong winds makes Damavand ascend very difficult. The South trail is the best side for climbs and skitours. Climbing is much more difficult in other faces. 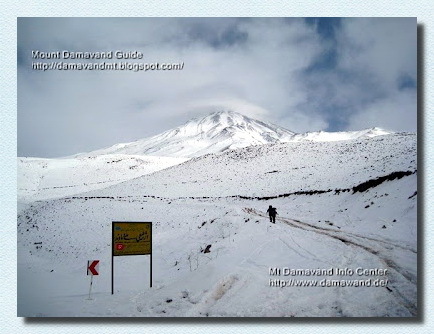 Visit also Damavand Winter Weather Warning and Damavand Weather Forcast. Due to vicinity of the Caspian Sea, there are heavy winter snow falls in the area. The amount of snow fall is different each year. It is recommended to check the ice and snow condition in advance. In winter, cars can not go up to the base camp and it is not possible to use mules in the area. So you should carry all equipments yourself or hire porters. Damavand Forum. Shelters are open during winter, but huts may be closed. Camp2 Goosfand Sara and Camp3 Bargah Sevom refuges need cleaning from snow and garbage if you are luckky enough to find them under snow! For a successful climb in winter, you need a very high skilled experienced guide. You should be very experinced, well-equipped. You need a good timing and fine weather. You must be well supported and be ready for any risky and unexpected condition. Visit also Winter Equipments. The winter season may start from October to November and last to May and April. In this period climbing to Damavand summit is very tough and dangerous. Because of high wind speed and very low temperature, stormy weather conditions, too much snowfall, icy trails and other risks. Winter ascend and ski mountaineering is graded as very difficult. The ski and snowboard season is from December to mid May, the best ski months are March & April. Start of gravel road to basecamp, when it is imposible to use the gravel road by car due to snowfall and ice condition of the road in winter, start climbing from this point. When you travel either from Tehran or North of Iran, you will come to this junction anyway. In 1970 when Reinhold Messner attempted a winter ascend to Mt Damavand Iran, due to adverse weather conditionshe failed, because he realized that despite a lack of technical difficulties, is not an easy mountain climbing, but a tough and difficult alpine challenge. Reinhold Messner ist im Jahre 1970 bei seinem	Versuch, den Damāvand zu besteigen, aufgrund von widrigen Wetterverhältnissen gescheitert; daran erkennt man, dass der Damāvand trotz mangelnder technischer Schwierigkeiten kein einfacher Wanderberg, sondern eine große konditionelle und hochalpine Herausforderung ist. Winter Klettern und Skitour Damavand 2015 Wintersport Activity-Tour, Wild Alpine Ski-und Snowboard Adventure Tours. Skitouren in den Iran Skigebiete in Alborz und Zagros-Gebirge. Reise Iran geführte Wintersport Abenteuer und Trekkingtouren. Winterwetter Warnung und Alarmierung. Damavand Foto. Teheran Outdoor-Aktivitäten, Besichtigungen Ökosystem, Fauna und Flora. Winter Climb and Skitour Mount Damavand 2015. Winter Sport Activity Tour, Wild Alpine Ski and Snowboard Adventure Tours. Ski touring to Iran Ski Resorts in Alborz and Zagros Mountains. Iran travel guided winter sport adventure and trekking tours. Winter weather warning and alerts. Damavand Photo. Tehran outdoor activity, ecosystem sightseeing, fauna and flora. Invierno Climb y Skitour Monte Damavand 2015. Deporte de Invierno Actividad Turísticos, Wild Alpine Ski y Snowboard Adventure Tours. Esquí de fondo a Irán Centros de Esquí en Alborz y Montes Zagros. Irán viajes guiados invierno deporte de aventura y trekking. Advertencia de clima invernal y alertas. Foto Damavand. Teherán actividad al aire libre, visitas turísticas ecosistema, fauna y flora. Hiver montée et Skitour mont Damavand 2015. Sport d'hiver Activité Tour, sauvage ski alpin et de snowboard Adventure Tours. Ski de randonnée à l'Iran Stations de ski en Alborz et Monts Zagros. Sport d'hiver aventure et randonnées Voyage guidé l'Iran. Hiver alerte météo et des alertes. Damavand Photo. Téhéran activité en plein air, visites écosystème, la faune et la flore. Inverno Climb e Skitour monte Damavand 2015. Sport invernale Attività Tour, selvatico alpino Sci e Snowboard Adventure Tours. Scialpinismo a Iran Stazioni sciistiche in Alborz e Monti Zagros. Viaggi Iran guidato avventura sport invernali e trekking. Inverno avvertimento tempo e avvisi. Damavand Foto. Tehran attività outdoor, ecosistema visite turistiche, la fauna e la flora. Winter Klatre og Skitour Mount Damavand 2015. Winter Sport Activity Tour, Wild Alpine Ski og Snowboard Adventure Tours. Skiturer til Iran Ski Resorts i Alborz og Zagros. Reise Iran guidet vinter sport eventyr og trekking turer. Vintervær advarsel og varsler. Damavand Photo. Teheran utendørs aktivitet, økosystem sightseeing, fauna og flora. Зимнее восхождение и Скитур Демавенд 2015 Зимние виды активность тур, Wild горнолыжного спорта и сноуборда Приключенческие туры. Лыжные прогулки в Иран горнолыжных курортов в Эльбрус и Загрос гор. Путешествия Иран руководствуется зимних видов спорта приключения и пешеходные экскурсии. Предупреждение погода зимы и оповещения. Damavand Фото. Тегеран активного отдыха, экосистема осмотра достопримечательностей, фауна и флора. Zimneye voskhozhdeniye i Skitur Demavend 2015 Zimniye vidy aktivnost' tur, Wild gornolyzhnogo sporta i snouborda Priklyuchencheskiye tury . Lyzhnyye progulki v Iran gornolyzhnykh kurortov v El'brus i Zagros gor. Puteshestviya Iran rukovodstvuyetsya zimnikh vidov sporta priklyucheniya i peshekhodnyye ekskursii . Preduprezhdeniye pogoda zimy i opoveshcheniya . Damavand Foto. Tegeran aktivnogo otdykha , ekosistema osmotra dostoprimechatel'nostey, fauna i flora .